Hooked On... - Nekaro & Co. It's another Friday so that means another blog party over at Hooked on Houses! What do you mean, you don't know about the party?! Head on over to see what everyone is hooked on this week. This week I'm hooked on cooking for less. Less is more, ya know! I'd heard on GMA about Clara over on YouTube and her Great Depression cooking shows. There is also a blog. We are a family of four with only one income so saving money at the grocery store is hard to do. Heck, you don't need a family of four to realize that going to the grocery takes a big chunk of your income. I had forgotten to take anything out of the freezer Wednesday for dinner so I looked up Clara on the internet for something I may be able to use for dinner. Viola! 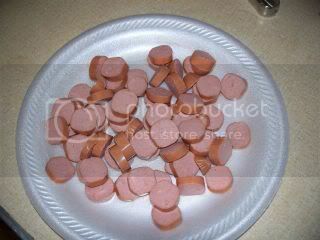 I found it.... the "Poorman's Meal"! Potatoes, hot dogs, an onion, and some spaghetti sauce (I think). I had all but the onion so I improvised. 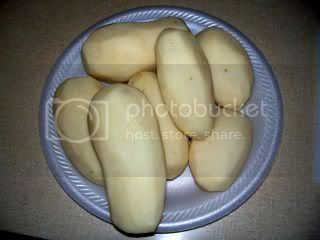 I cubed the potatoes. If I'd had an onion this is where I would have diced the onion. 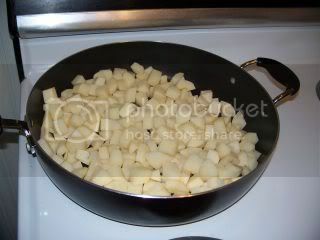 I added the taters to the pan. 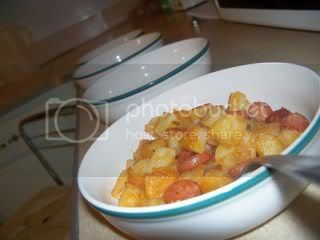 While the potatoes and onions were cooking, I cut up four hot dogs. I think this would be equally as good, if not better with some polska kielbasa, but since we are ballin' on a budget here... hot dogs work just fine. 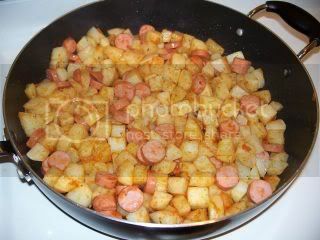 I waited until the potatoes where about half way done then I added the hot dogs and a few spoonfuls of spaghetti sauce. I think that's what she used in the video, but I think you could use salsa or alfredo sauce if you wanted to. I used the Wal-Mart brand "Italian Garden Combination" flavor of sauce. Don't forget to go visit the blog party!! Have a great weekend!